BoingBoing uses unicorn chasers after annoying or disturbing imagery. I am going to follow up those counterfit Windows images with a sunset chaser. Ottawa, Ontario, Canada, view from Wellington St, along the Rideau Canal locks towards Ottawa River. In the distance is the bridge to Hull, Quebec, and Museum of Civilization. 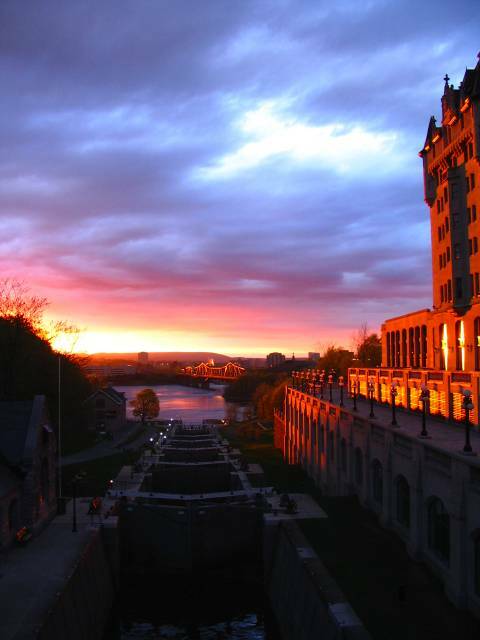 On the right is Chateau Laurier and part of Major’s Hill Park behind it. Taken on May 5th, 2006.